London (AFP) – US President Barack Obama on Friday issued a stark warning to British voters considering leaving the European Union, warning a Brexit would lessen the country’s power and hurt job-creating trade ties. 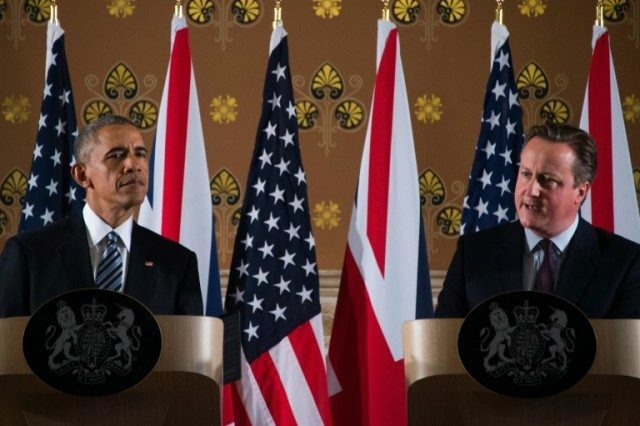 Obama said “Britain is at its best when helping to lead a strong Europe”, while warning the UK on its own would move to the “back of queue” for trans-Atlantic trade deals if it votes to leave the EU in a referendum in June. With an eye on the crunch referendum on EU membership, Prime Minister David Cameron made the case for a vast trans-Atlantic trade deal. “It would add billions to our economies and set the standards for the rest of the world to follow,” Cameron said of a deal, which Britain could be excluded from should it leave the EU.